In 1856 Perkin introduced the first synthetic dye, Mauve, to the English textile market and therewith not only founded the dyestuff industry but sounded the death knell for natural dyes. Since earliest times the use of colour had been restricted to the natural products founded in the environment - plants, some animals, and a few types of minerals. Within a few short years of Perkin's discovery a complete range of unnatural colours was available to the dyer, in most cases possessing fastness properties far superior to the natural product and, as the coal-tar industry grew, at a fraction of the cost. Today, with the exception of a few isolated primitive villages in the world, or for the handicraft worker who believes that nature knows best, these natural dyes are of little economic importance. However, although the use of natural colorants for textiles and fibers has declined, the use of nature-produced compounds for coloring foods and ingested products has recently increased. With extensive testing of all synthetic products for carcinogenicity and mutagenicity, the food dye industry has returned to natural products as the source of its coloring bodies. Natural dyes comprise those colorants (dyes and pigments) that are obtained from animal or vegetable matter without chemical processing. They are mainly mordant dyes, although some vat, solvent, pigment, direct and acid types are known. There are no natural sulfur, disperse, azoic or ingrain types. 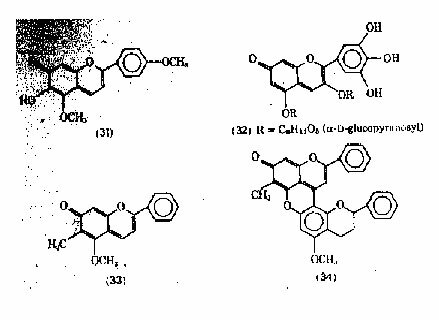 This article discusses the more important, formerly commercial dyes along structural lines: anthraquinones, naphthoquinones, indigoids, cartenoids, etc. 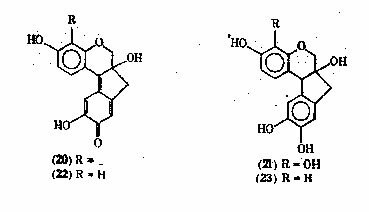 Some of the most important natural dyes are based on the anthraquinone structure. They include both plant (madder, munjeet, emodin [518-82-1] ) and animal (lac [6219-66-5], kermes [476-35-6], cochineal [1260-17-9] ) types. Plant Anthraquinone Dyes Madder : Madder, or now better known by its common chemical name, alizarin, is one of the most ancient of natural dyes. Reference is made to it in Egyptian, Arabic, Indian, Persian, Greek, Roman and Germanic literature. Cloth dyed by madder has been found in predynastic Egyptian tombs. The approximately thirty-five species of madder plants belong to the order Rubiaceae which are found throughout Europe and Asia. The coloring material is concentrated in the roots of the plants, occurring to a maximum concentration of 4%. These perennial plants are allowed to remain in the ground for 18-28 mo at which time the roots are dug up, washed, dried and finally ground. The primary use of madder is dyeing cotton Turkey Red by mordanting with alum in the presence of lime. Madder also dyes wool with an alum or chrome cream of tartaz mordant. It can be dyed from a single dye bath using sulfuric acid but the properties of the dyeing are not as fast as those produced on a mordant. Use of hard water or the addition of lime to the dyebath is essential. Madder also dyes silk when mordanted with basic aluminum sulfate; such dyeing have excellent fastness properties. Although known for more than 6000 years, it was not until 1826 that the actual coloring matter was isolated from the root. 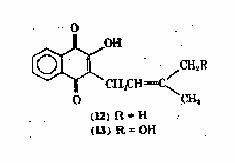 Subsequent synthetic studies (11) arrived at 1,2-dihydroxyanthraquinone (1) as the structure of the major colour-producing body; this was called alizarin, going back to the ancient name alizari or lizari for the root of the madder plant. Alizarin was the first natural dyestuff to be produced synthetically in 1869 in von Baeyer's laboratory. Anthraquinone was dibrominated, then fused with alkali. It was many years later that the true structure of this reaction series was elucidated: that the dibromo compound does not correspond to the dihydroxy product, but undergoes rearrangement during alkali fusion, probably involving fission of the quinone ring and ring closure to an alternative position. This method was not commercially acceptable, however because of the expense of bromine and the technical inability at the time to carry out the caustic fusion on a large scale. Caro of Badische and Perkin in England independently discovered that anthraquinone could be heated with concentrated sulfuric acid to yield a water soluble sulfonic acid; this could then undergo caustic fusion and further air oxidation to yield alizarin. in their own right: purpurin (CI Natural Red 16, CI 75410) (2); purpuroxanthin (CI natural Red 8, CI Natural Red 16, CI 75340) (3), and pseudopurpurin (CI Natural Red 14, CI 75420) (4). However they do not contribute a synergestic effect to the properties and shade of pure alzarin. The most important adduct of alzarin is the glycoside, ruberytheric acid [152-84-1] (5). The sugar constituent has been shown to be primeverose. With the exception of lac dyes from ancient India, Kermes or Kermesic acid is the oldest of all insect dyes. It is obtained from an oriental shield louse which lives on the leaves and stems of low, shrubby trees, the holm oak, Quercus ilex and the shrub oak, Quercus coccifera. The name kermes is derived an Armenian word meaning little worm for which the latter Latin equivalent was vermiculus, the basis of the English word vermillion which is the colour that insect dyes natural fibers. Mention is made throughout the ancient literature in reference to this colour: Moses; Theophrastus, the Greek botanist; Pliny the Elder; the Roman emperor Diocletian. It was particularly important during the Golden Age of Venice, when its dyeings rivaled the fabled Tyrian royal purple, and the search for additional sources stimulated the world exploration. The coloring matter is obtained from the female Coccus ilices. These insects have been collected historically by women, it being noted that they allowed finger nails to reach a more than normal length in order to assist them in their work. One woman could pick about a kilogram of insects a day by candlelight, before daybreak, when the dew had not yet evaporated and the thorny holly or oak leaves were still soft. It is slightly soluble in cold water, soluble in hot water giving a yellowish-red solution. On dissolving in concentrated sulfuric acid a violet red is obtained which turns blue on the addition of boric acid. The fame of its colour is owing to the brilliant scarlet obtained when dyed on alum mordant. After the discovery of Mexico and the exploitive tactics of Cortez and the Spanish King, Charles V, cochineal replaced kermes as the major reddish orange on the continent; a monopoly that continued for over three hundred years. It was not until 1858 with the introduction of Aniline red that the Mexican-Spanish corner on the market was finally broken. Such a state secret was the source of this new world dye that even as late as 1725 it was commonly believed that cochineal was the seed of an American tropical plant. In actuality, cochineal is obtained from an insect of the same name which feeds on the cactus Nopalea Cochinellifera. Even before the conquest of the Spaniards the value of the dye was legend. It is reported that the Aztecs used it as a medium of tribute; that in the 1480s Montezuma had extracted the state of Huaxyacas (modern Oaxaca) a yearly tribute to 20 sacks of cochineal. Considering that ca 1,55,000 dried insects are required to produce 1 Kg of cochineal dye, the value of such tribute is enormous. Cochineal insects require only three months to mature, but because of the rainy season in Mexico, labor intensive operations are required. With the approach of the rainy season, branches of the cactus plants loaded with the young insects are cut off and stored indoors. The insects are carefully brushed off into bags or small wooden bowls. They are killed either by immersion in scalding water, heated ovens, or long exposure to the hot sun. The latter method yields the highest quality dye. The dried insects have the shape of irregular, fluted currant like grains. These contain approximately 10% carminic acid (7). The major use of cochineal was on tin-mordanted wool and alum-and tin-mordanted silk to produce brilliant scarlets. It is applied to wool from a bath containing an acid solution of stannous nitrate and tartar. Traces of copper and iron dull the dyeings. Fastness of light is good but that to washing is poor, i.e., the dyeings become duller and bluer. Of current interest, the alumina lake of cochineal, called carmine [1260-17-9], has found use in the food dye industry. It is permanently listed as approved by the FDA of ingested products. The lake is composed of not less that 50% carminic acid (7). Carmine is currently sold at $330 / Kg. Liquid formulations prepared by dissolving carmine is an ammonia-propylene glycol system are also commercially available. Recent uses have included coloring toothpaste, bakery goods, applesauce, and pharmaceutical tablets (see Colorants for foods, drugs, and cosmetics). Lac Dye: Lac is probably the most ancient of the animal dyes. It has been used in Southeast Asia and India since the beginning of record history. The word lac is derived from the Sanskrit Laksha and is the same as the Hindu word Lakh which means one hundred thousand, suggesting the countless thousands of insects which infest the trees. The dye is derived from the gum lac or viscous fluid made by the insect Coccus laccae which bore into the bark of the trees and become enclosed in an exuding juice, which hardens into a resin. The branches of all trees on which the lac insect reproduces are covered with this red-brown resin. The so-called stick lac is harvested and marketed as the crude product, containing about 10% coloring matter. A more concentrated form is obtained by extraction with hot sodium carbonate solution. The dye is precipitated by addition of alum or lime. The dye yields scarlet and crimson shades which exhibit good fastness properties, especially to light and water. For a time lac was used in preference to cochineal in Europe in an attempt to break the Spanish monopoly, but because of the resinous and mineral impurities that are found in lac, its inferiority as a competitive dye caused its decline. Common name and structure no. Table 1 summarizes many other naturally occurring dyes of anthraquinoid structure. Just as in the fused three-ring system of anthraquinones, in the two-ring naphthalene base system nature has developed enough conjugation to achieve colour. Three major chemical systems yield natural dyeing materials: a-naphthoquinones, flavones, and anthocyanidins. a-naphthoquinones : The leaves of the tropical shrub henna, Lawsonia inermis, cultivated mainly in Egypt and India, upon extraction with hot water yield the yellow pigment lawsone which dyes wool and silk an orange shade. For many years a paste (a henna rinse) made from dried henna leaves has been used for tinting hair a reddish shade. Lawsone has been identified as 2-hydroxy-1, 4-naphthoquinone (9). The isomeric 5-hydroxy compound (10), commonly called Juglone, Nucin, or Regianin, is found in the shells of unripe walnuts, usually in the colorless leuco form, a-Juglone (11). The shells are ground, fermented for two days, and extracted with hot water. In this processing the colorless hydro form undergoes air oxidation to yield the quinone structure that dyes natural fibers a yellow-brown hue. Lapachol (12) is found in Lapachol or Taigu wood from South America and in Bethabara wood from West Africa. The pigment forms a bright red, water-soluble sodium salt. It is isolated by extraction of the raw wood with cold sodium carbonate solution (1%); precipitation; extraction with ether. Until recently this dyestuff was much sought after for use in the manufacture of high quality bows and fishing rods. *Dyes CI 75530 and CI 75535 are enantiomers. Flavones: A majority of the naturally occurring yellows have the flavones basic structure. 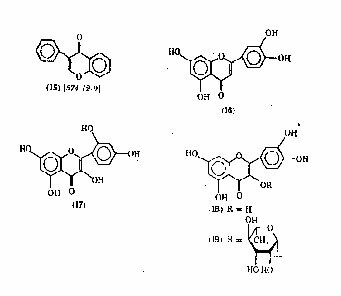 Flavones [528-82-6] (14) (2-phenylbenzopyrone), a colorless material of mp 97Â°C is obtained from the primrose. 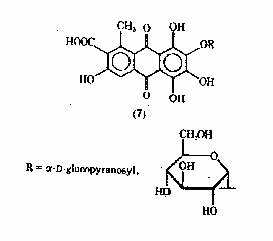 Most of the natural yellows are derivatives of hydroxyl and methoxyl substituted flavones or isoflavones (2-phenylchromones) eg., structure (15), which are present in the plant as glycosides or esters of tannic acid. Some of the more common naturally occurring yellows of these group include: luteolin (16) found in the herbaceous plant Reseda lureola, or dyer's weed, once cultivated extensively in England, France, Germany, and Austria. This was specified in most European government contracts for dyeing gold braid. When used on alum-mordanted silk the braid has the best fastness to light of any natural yellow. It has a long history: the Gauls used dyer's weed, and it is still in use in some parts of Europe for dyeing leather. Morin (17) is found in the wood of the Osage orange, Maclura pomifera, located throughout the United States. It is used in the United States on chrome-mordanted wool and nylon, tin-weighted silk and chromed leather. 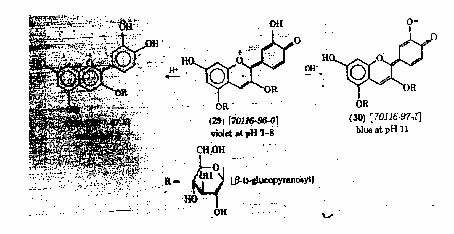 Another polyhydroxylated flavone is Quercentin (18). It is found primarily in the inner bark of Quercitron. Quercus tinctoria, an oak indigenous to Pennsylvania, Georgia, and the Carolinas. Lesser concentrations are present in horse chestnuts, onionskins, tea and sumac. A red shade (CI Natural Red 1 [70247-65-5] ) is obtained by rapidly extracting the bark with dilute ammonia, then boiling the extract with sulfuric acid. A yellow shade (CI Natural Yellow). 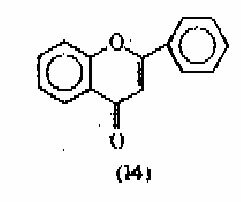 Dihydropyrans: Closely related in chemical structure to the above flavones are substituted dihydropyrans. The most important naturally occurring members are haematin (20) and its leuco form, haematoxylin (21). These are the principal coloring bodies of log wood (CI Natural Black 1, CI 75290) historically one of the most important natural dyes for dark shades of silk, wool, cotton, leather, wood, and animal bristles, hair and fur. It is still used extensively in dyeing and tanning leather. Logwood is the heartwood of Haematoxylon campechianum, a tree found in the moist climate of Mexico and Central America. It goes by a variety of names around the world: bois de Campeche in France (after the Provice of Campeche in Mexico where it was discovered); blauholz in Germany (because of its main use in producing blue dyeings); blood wood, its common name in the 1700s, caused Linnaeus to apply the generic name Haematoxylon to the tree from which log wood is obtained. The dyestuff is obtained from the wood by either the French or the American process. In the French process the logs, weighing several 100 Kilograms, are reduced to chips and extracted with boiling water. In the American process this extraction is carried out under 103-207 kPa (15-30 psi) of steam. These weak extracts are then concentrated under vacuum or evaporation to obtain crystals or solid extracts. During this concentration the hematoxylin is partially converted to its oxidized form. This rate of oxidation is increased with the addition of alkali. Logwood extracts may be unoxidized or oxidized to varying degrees, the haematin content varying from 20 to 100% of the total coloring matter present. Brazilwood (CI Natural Red 24; CI 75280) is closely related in chemical structure to Logwood. 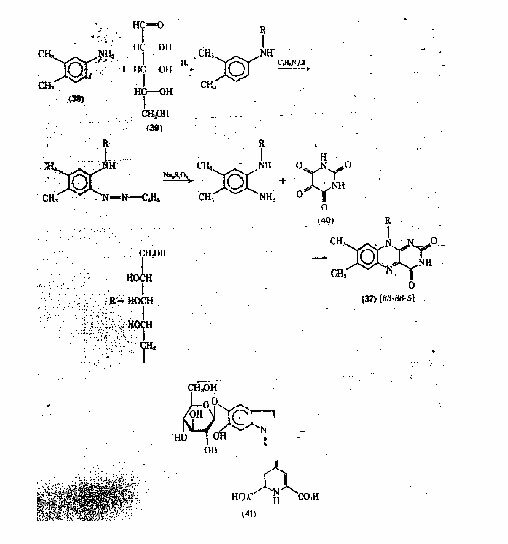 Again a leuco form, brazilin (22) and its oxidation product, brazilein have been identified. This occurs in the wood of various species of Caesalpina, found in Asia and Central & South America. The Asian species was known in medieval times with the Portuguese with braza referring to anything having a bright red colour. Thus when Portugese explorers discovered the area of South America that had an abundance of trees which they knew produced brilliant red colours and they named the area Brazil. Although formerly used as a mordant dye on cotton, wool, and silk, this red dye has a very fugitive character and is no longer of economic importance. Anthocyanidins (Flavylium Salts): Even the linguistic derivation of the name of this class of chemicals denotes the ancient connection with natural dyes: antho meaning flower and kyanos meaning blue in Greek. These are glycosides of hydroxylated 2-phenylebenzopyrylium salts (flavylium salts). The structure of the parent cation can be considered a resonance hybrid of oxonium forms (24) and (25), and carbenium forms (26) and (27) [14051-53-7]. The anthocyanidins are usually isolated as the chlorides after hydrolytic fission of the glycoside with hydrochloric acid. The colour developed by the plant is determined by the pH of the cell sap. For example, cyanine is red under acidic conditions (28), violet at neutral pH (29), and blue under alkaline conditions (30). Naturally occurring members of this class include: Carajurin [491-93-0] (31), obtained from the leaves of Bignonia Chica in Central America and used by the Indians of that region to dye cotton and wool a brilliant red-orange. Awobanin (32) obtained from the flower Tsuyukusa, Commelina communis in Japan and used in making awobana paper; it was formerly used in Japan for dyeing silk blue. Dracorhodin (33), a resinous secretion found in the fruits if Doemonorops propinqus in Sumatra and Borneo. It is found in association with its bis derivative, Dracorubin (34). Together these two reds have a formidable name Dragon's Blood (CI Natural Red 31) which is used for coloring lacquers and varnishes and in the printing trade for preparing halftone plates for multicolor printing. Natural dyes, particularly red shades, have become increasingly important for use in food coloring. The initial approach by the food dye industry has been to return to natural dyes. Two natural products currently being produced commercially are of the anthocyanin class. Cranberry juice concentrate is prepared from the juice of mature cranberries under low temperature and pressure. A powdered form is obtained by spray-drying a blend of this concentrate and malto-dextrin. 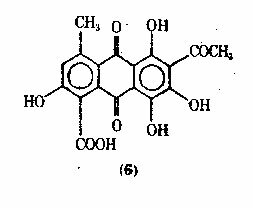 Peonidin (35) is the substituted anthocyanin primarily responsible for the colour in cranberries. 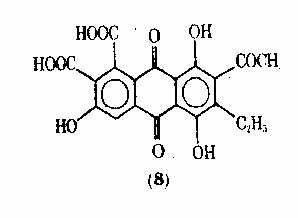 Very similar in chemical structure is the exact (36) of grape skins, enocionina. This is obtained commercially by aqueous extraction of grape skins after pressing. In addition to the anthocynin colour body, tartaric acid, malic acid, tannins, and minerals are present in the concentrated extract. This is also available as a spray dried powder. Both the cranberry and the grape extract have FDA approval as an additive for food use. Alloxan Adduct: A yellow dye currently being used, as a food colorant is the phosphate salt of riboflavin (37), vitamin B2. This is found in varying amount is all plant and animal cell; particularly good natural sources are milk, eggs, malted barley, yeast, liver, kidney, and heart. Excretion of riboflavin in the urine is responsible for the yellow colour. Structurally, riboflavin is an alloxan derivative. Besides the natural sources, riboflavin can be synthesized from 3,4-xylidine (38), ribose (39), and alloxan (40). Alloxan can be prepared by more readily available barbituric acid. In 1977 the price of riboflavin-5-phosphate [146-17-8] was $110 / Kg. Another natural dye that is currently being used in food, is that obtained from red beet extracts, Beta vulgarus. This is available as beet juice concentrate, dehydrated beetroot and spray dried extracts. Red beetroot contains both red and yellow pigments of the class betanines; these are quarternary ammonium amino acids. The red colored bodies are betacynine pigments of which the major constituent is betanin (41). Two very important natural dyes have the indigoid structure. Indigo [482-89-3], the main product which gives this dyestuff class its name, is still one of the major dyes of the world, although now made via a synthetic route. Tyrian or royal purple, although no longer in demand, was once the price sought by the Caesars. Tyrian Purple: Probably the most expensive dyestuff in history and the colour with the most prestigious associative value was the Royal Purple of the Caesars. Even its discovery has found a place in ancient mythology: the legend is that a sheep dog of the Greek hero Hercules, while attempting to bite into a shellfish, stained his jaws bright red. Hercules, noting the rarity of the hue, ordered a gown to be dyed with the newly discovered colour. The kingdom of Tyre did produce a purple dye as early as 1600 B.C. and distribution by the Phoenicians brought fame and fortune to the area until final conquest by the Arabs in 638 A.D. The properties of this dyestuff, namely brilliance and non-fading, were so famous throughout the Greek and the Roman worlds, and the source of supply so limited that it was reserved only for the most powerful. Augustus Caeser decreed that only the emperor and his household might wear "The Purple." Not surprisingly, the enemies of the Empire, particularly the early Christians, abhorred purple. The source of this colour is the pupura shellfish or Murex brandaris found in shallow waters throughout the Mediterranean. Each mollusk contains a few drops of glandular mucous; this fluid at first appears white, but on exposure to light changes to yellow-green and eventually violet or reddish-purple. Ancient recipes show that the shellfish were crushed, salted for three days, and boiled for about ten days. Different shades of purple could be obtained by mixing with honey or orseille. 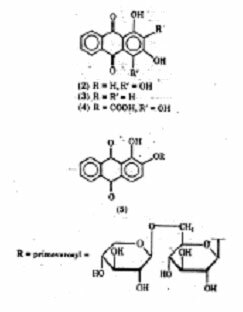 It was not until 1909 that the structure of the active dyestuff was finally elucidated (85). It is reported that it required 12,000 mollusks to obtain 1.4g of dye on which the structural identification could be carried out. This was shown to be 6,6'-dibromoindigo [19201-53-7] (42). Indigo : If any one colour and fabric could be used to characterize taste or style in even reaching fad proportions in the mid 1970s, it would be blue jeans. A recent industry survey estimated world demand to be 13,000 metric tons per year (86). The dyestuff behind this national colour is indigo, now of course, a synthetic product (as CI Vat Blue 1; CI 73000) but originally a naturally dye (CI Natural Blue 1; CI 75780) whose history started long ago in India, as the name denotes, long before Levi Strauss invented his jeans. Indigo may be the oldest natural dye used by man; its method of preparation is described in ancient Sanskrit writings; Egyptian tombs have contained mummies wrapped in cloths dyed with indigo. The name itself is derived from the medieval name Indicum, a Latin word originally used to cover all imports from India, but whose meaning gradually changed to specifically mean the blue vegetable dye whose importation greatly increased in Europe during the Middle Ages. The word indicum replaced the Arabic word al-nil which ment blue; this linguistic route is still present in chemical terminology as the base for aniline, the principal building block of the synthetic dyestuff industry. Natural indigo is obtained from the leaf of Indigofera tinctoria, a leguminose, widely distributed in Asia, Africa, and America. The dye is contained only in the leaf of the plant, unlike other vegetable dyes where the coloring matter is also found in the stalk, pods, and twigs. The shrublike plants, obtaining the height of 0.9-1.5 m, is harvested twice a year. Processing must be done rapidly; the plant is cut down early in the morning and as quickly as possible placed in vats and steeped in water for 9-14 h. The percentage of dye obtained is directly proportional to the freshness and moisture content of each leaf. The liquid is drawn off to beating vats, where it is air-oxidized by means of striking the slimy surface of the leaves with bamboo sticks. The liquid gradually changes from yellow-orange through dark green to blue as their oxidation is completed. The precipitated crude indigo is allowed to settle for 2 h; the top water is drawn off and the sludge transferred to a large cauldron where it is heated to prevent further fermentation. When cool, the sludge is filtered through linen or cotton cloths onto trays where it dries to the consistency of a stiff paste. This is cut in bars or cakes for sale. Despite the crudeness of these operations, they may still be found today in the rural villages of India, the Philippines, and South America. Not only was indigo used to dye fibers for garments, a powdered form has been used since antiquity as a paint and cosmetic. The Greeks and Romans developed a blue crayon which was widely used as an eye shadow. Until the invention of tempera paints in the Middle Ages, indigo was used as the basic blue in paint. It was even used medicinally, as an astringent. The Greek Dioscorides reported that it cleaned wounds and was used for ulcers and inflammations. As late as the 17th century it was prescribed for internal use. The venetians appeared to be the first Europeans to use the indigo from India through their vast trading empire. However its use did not spread immediately throughout Western Europe. A locally grown plant, isatis tinctoria, known as woad has been used since antiquity for dyeing cloth blue. Although the chemical structure of the principal coloring body is the same for woad as Indian indigo, woad industry was firmly entrenched in Europe and would not be replaced by the expensive import from the East until much cheaper sources from Central America were available two hundred years later. The threat to the woad industry by indigo was so great during the 16th and the 17th centuries that England, France and Germany passed laws prohibiting the importation of indigo under the belief that it was devil's dye, being harmful, deceitful, and corrosive. The true nature of indigo was kept secret for thousand of years. Like cochineal later, the dyers had no concept of the source of their dyestuff material. As late as 1705 some dyers believed indigo to be mineral; a British patent was granted that year for obtaining the blue stone brought out of India from mines. It was not until the 1870s that a modern approach to structural identification of natural indigo was undertaken by A. von Baeyer in Germany. For many years the laboratories of von Baeyer in academia and Badische Anilin-und Soda-Fabrike in industry were jointly on the indigo problem. 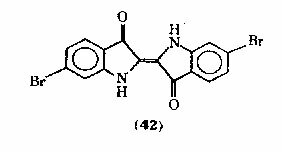 The structure was finally elucidated by von Baeyer observing the inter conversion of isatin (43), indoxyl (44), and indigo (45). Von Baeyer originally published the structural formula in the cis form; it was not until the x-ray studies of Reis and Schneider in 1928 that the trans configuration was proven. A synthetic route was devised by von Baeyer to manufacture indigo. This process, starting with O-nitrobenzaldehyde, was sold to BASF with reduction to practice accomplished in 1897. Although this route did not achieve economic success, it did demonstrate the feasibility of manufacturing synthetic products that could compete with natural products. It also began a competition, primarily between Germany and England, for control of the multimillion-dollar dyestuff market. The English textile market, geared for the natural product, demonstrated that the synthetic product did not have the same hue and dyeing characteristics as that produced by nature. They were correct. Natural indigo also contains Indigotin [482-89-3], Indirubin [479-41-4] (CI 75790) (47), Indigo Brown, Indigo Gluten, and Indigo Yellow [520-18-3] (CI 75640) (48). It did not possess greater affinity for the fiber and better fastness properties. The Germans countered with a variety of recipes for adding additional ingredients to the dyebath so that their synthetic product would more closely approximate the natural one. Cost reduction programs for the natural product, and many new roots for the synthetic product were reported for a period of 20 years. As late as 1922 the English were still championing the natural product; however, the synthetic dyestuff industry was established. There are over 30 different synthetic roots to indigo reported in the chemical literature. The first successful commercial process was developed by Heumann at BASF in the 1890s. It was in use at Ludwigshafen for 30 years. 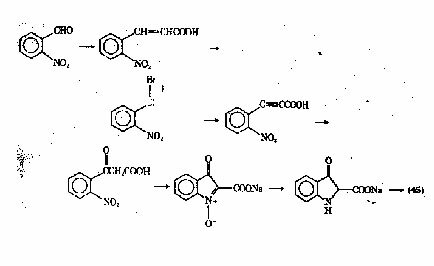 Variations on this scheme include the condensation of aniline, formaldehyde, and hydrocyanic acid to form N-phenyleglycinonitrile, followed by alkaline hydrolysis to yield N-phenyleglycine which gives indigo in 94% yields. This is the major commercial route used throughout the world. In an industry noted for its batch operation this scheme was put on a continuous basis by BASF at Ludwigshafen. Although the demand for indigo to colour blue denim seems to be declining, most industry analysts feel that there will always a comparatively high demand for denim work clothes. Even though the requirements may not stay at 13,000 t/yr, the product will remain one of the major industrial dyes. Although most colour in the visible spectral range is generated by conjugated aromatic ring systems, another class of dyes found in nature obtains its colour owing to the presence of long, conjugated double-bond chains. These dyes are the carotenoids; the class name being derived from the orange pigment found in carrots, carotene. They are also known as lipochromes because of their solubility and occurrence in fats. Carotene: Carotene (Natural Yellow 26 [36-88-4]; Natural Brown 5; CI 75130) is widely distributed throughout the vegetable and animal kingdoms. 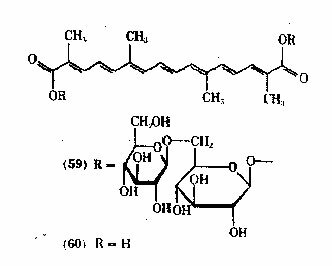 Carotene was first isolated by Wackenroder in 1831, as ruby red crystals, from the common carrot; it was not until 1907 that Willstatter established an identification of carotene as a single product, C40H56, with mp184Â°C, product contained three isomers: a (49), mp188Â°C; b (50) mp184Â°C; g (51) [502-65-8], mp178Â°C. There is also a close structural relationship between these two vegetable coloring dyes and vitamin-A (57), the fat-soluble growth factor. One of the early clinical observations was that rats suffering from a deficiency of vitamin-A could be cured by feeding with the extracts of green plants; a correlation between growth activity and the amount of carotene in the feedstock was shown. It was later established that the carotenoids are converted into vitamin A in the liver. The retina of the eye contains light sensitive pigments that are made up of proteins combined with carotenoids. In exposure to light the pigment bleaches, liberating the protein opsin and the carotenoid, vitamin A aldehyde. Carrots supply the starting materials for these chemical and biochemical transformations. The carotenoids have found use as colorants in foods and ingested drugs. b-carotene is permanently listed by the FDA as an FD&C approved colorant (see colorants for foods, drugs and cosmetics). At present it is available commercially as a thirty percent liquid suspension; a twenty four percent semi solid suspension; a ten percent beadlet-water dispersion, and a three percent emulsion. Annatto: Another carotenoid, extract of annatto, is also used in food coloring. Currently its main use is in dry products such as butter, margarine, and cheese. Annatto is obtained from the pulpy portion of the seeds of the plant Vixa orellana, found in India, Central America and Brazil. After the seeds and pulp have been removed from the matured fruit, the residue is macerated in water and strained; the coloring matter is filtered, dried, compressed? The chief ingredient of annatto is bixin [6983-79-5] (58). In saponification, methyl ester is hydrolyzed to give the diacid, nor-bixin. Annatto extract is available in aqueous solutions, oleaginous dispersions, and spray dried powders. Saffron: Saffron is obtained from the pistils of the Crocus sativus, a plant which flowers in the fall and is quite different from the common spring variety crocus. The name of the plant comes from the Arabic za faran, meaning yellow. During Greek and Roman times saffron enjoyed a variety of uses. Not only was it the principal yellow dye of the ancients, it was used extensively as spice in cooking, as an ingredient in medicinal formulations, as a perfume in the public baths. Later, in the Middle Ages, it was found that when used as a mordant on paper with iron, a realistic imitation gold could be obtained; this made possible the beautiful illuminated manuscripts which the monasteries produced and which are still treasured art works. Like many ancient dyes, the natural source was limited; it has been estimated that it requires 140 stigmata to produce one gram of dyestuff. This dyestuff was even the subject of a war, the so-called Saffron War of 1374. Because of its rarity, it was in great demand. Basle, Switzerland was the center of trade (the saffron blossom even became part of Basle's coat of arms). When a consignment of ca 360 Kg of saffron from Italy was seized as booty, an army was sent out to recover the dyestuff and clear the roads for safe passage of commerce. 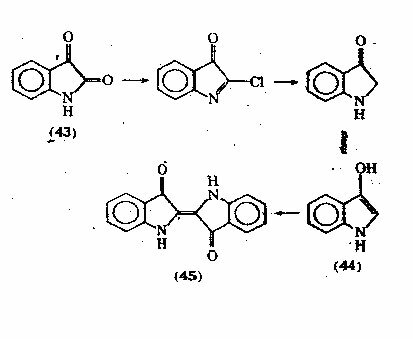 The structural formulas (56-57) are based on the experimental observations that they take seven moles of hydrogen on catalytic hydrogenation; oxidation with chromic acid yields three to four moles of acetic acid per mole of pigment; and they are dibasic acids. The structures were confirmed by synthesis of perhydrocrocetin. Unlike the other natural products discussed in this article, one might not consider chlorophyll in the same class as dyestuff. This is probably because chlorophyll does not have affinity for the natural fibers, especially cotton and wool, which can be made into wearing apparel. However, if one overlooks this most common dye requirement, chlorophyll is indeed a dyestuff (CI Natural Green 3; CI 75810). It is used extensively for coloring soaps, resins, inks, waxes (eg, candles); because it is physiologically harmless it is used in the coloring of edible fats and oils (eg, chewing gum, confectionery, egg white, gelatin), and for cosmetics, liniments, lotions, mouthwashes and perfumes. In the usual sense of a dye, it is used to colour leather, where it exhibits good penetrating power and is especially light stable. Chemically pure chlorophyll is very difficult to prepare; therefore, the commercial product, like that found in nature, is a mixture along with several colored substances of the carotenoid family. The major components of the natural mixture have been designated chlorophyll a (61) and chlorophyll b (62), in a ratio of approximately 3 to 1, along with yellow, orange, and red colored bodies. The excellent hiding power of the green chlorophylls usually mask the rest whose presence is unknown until the chlorophyll is destroyed, as in the case of autumn leaves. The fundamental ring system consists of four pyrrole rings linked at the a-positions by methine bridges. The chlorophylls are magnesium salt complexes, hydrogenated in the 7,8-position, with a 6, g-ethanone ring. In chlorophyll b, an aldehyde group replaces the methyl group in position 3. 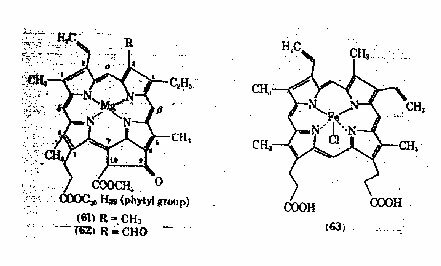 There is a chemical resemblence to hemin (58), an iron salt complex from mammalian blood. Commercial chlorophyll is obtained via a multistep process. The natural source of leaves (usually from stinging nettle, spinach, alfalfa, or corn) is extracted with petroleum ether (VM&P naphtha) to remove a majority of the carotenoids, fats, oils, and waxes; this is followed by another extraction with 80% acetone followed by filtration. Low boiling petroleum ether is added to this extract; the acetone is removed by washing with distilled water; there is another extraction with 85% methanol to remove most of the yellow pigments; the methanol is removed from the petroleum ether by extended washing with water. The chlorophyll precipitates, and it is isolated from the petroleum ether by centrifuging. The process, being again with acetone, is repeated five or more times. All this must be done in subdued light to prevent photodecomposition of the dissolved chlorophyll. 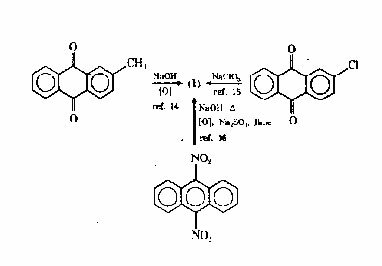 Separation of chlorophyll a (61) from chlorophyll b (62) is accomplished by the chromatographic method of Winterstein and Stein (96) using a dried solution of the product in 1 part benzene and 10 parts petroleum ether with fine sugar (X grade) as the absorbing medium. The separation is accomplished with Girard Reagent T (trimethylaminoacetylhydrazide chloride), which reacts preferentially with the formyl group of chlorophyll b, giving a water-soluble product, whereas chlorophyll remains unreacted and insoluble.